Coming from a Java world where projects and libraries without logging are unheard, it was a big surprise to see that all django apps that I have downloaded so far do not include logging, even though Python has a very good support for logging, it was inspired by the log4j. For a reason that I do not know they choose not to log, I suppose it is a kind of situation where everyone else knows but me! When you create a django application you have one module to add your model classes the models.py and one module to add your views the views.py (also called actions in other web frameworks), and there are possibly other modules like forms.py and admin.py. This is perfectly fine when you have a small application with a couple of classes in your models.py and few functions in your views.py. However, this files start to become unmanageable when adding more and more code. For example, in one of my projects the views.py is more than 600 lines and the models.py contains more than 20 classes. For that reason I decided to split the models.py and put each class in its won module, and also organize the views.py in more modules depending on related functionality. To split the views.py in more modules it’s a no brain task, it is simply a python module and there is nothing that can prevent you from doing so. However, the models.py needs more attention and few more steps to accomplish the task since this module is used by the manage.py module. Lets take an example and organize the code so it is more manageable. Of course the admin.py and the forms.py modules can be organized in the same way. Django is a popular python web framework. It is relatively easy and you can learn it from the tutorials that are provided by the django team. Although the tutorials are very good, for a more professional and in depth learning one should consider to buy a book or two. In the market there are excellent books for django. The first part of the book introduces Django fundamentals like installation and configuration. You’ll learn about creating the components that power a Django–driven web site. The second part delves into the more sophisticated features of Django, like outputting non–HTML content (such as RSS feeds and PDFs), plus caching and user management. The third part serves as a detailed reference to Django’s many configuration options and commands. The book even includes seven appendixes for looking up configurations options and commands. Anyone that does serious development with django must have this book. In June 2009 the second edition is coming out. Build a django content management system, blog, and social networking site with James Bennett as he introduces the popular Django framework. You’ll work through the development of each project, implementing and running the applications while learning new features along the way. In June 2009 the second edition is coming out. Pro Django more or less picks up where The Definitive Guide to Django left off and examines in greater detail the unusual and complex problems that Python web application developers can face and how to solve them. This book is for companies looking for a framework capable of supporting enterprise needs, as well as advanced Python or web developers looking to solve unusual, complex problems. This is an excellent book to begin djano, it also contain a chapter on how to integrate django with jQuery. This book will show you how to assemble Django’s features and leverage its power to design, develop, and deploy a fully-featured website. It will walk you through the creation of an example web application, with lots of code. Each chapter will add new features to the site, and show what parts of Django to work on to build these features. This book will help you to master the Django template system. Built-in template tags and filters are explained with examples and usage notes, as well as information on building custom tags and filters to extend the system for your needs. You will learn to use inheritance to create modular templates that are easy to maintain. You will learn how to serve multiple templates from within the same Django project, with an example of how to serve different templates for a mobile version of your site without having to change any code in your views. Pagination, internationalization, caching, and customization of the automatic admin application are also covered. This book will show you how to assemble Django’s features and take advantage of its power to design, develop, and deploy a fully-featured web site. It will walk you through the creation of an example web application, with lots of code examples. Specially revised for version 1.0 of Django, the book starts by introducing the main design concepts in Django. Next, it leads you through the process of installing Django on your system. 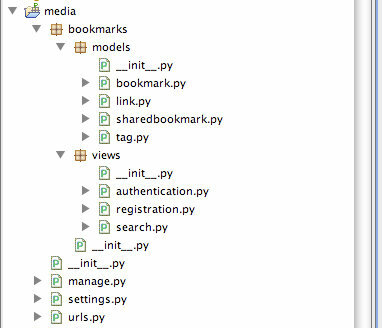 After that, you will start right away on building your social bookmarking application using Django. Various Django 1.0 components and sub-frameworks will be explained during this process, and you will learn about them by example. Designed for experienced website developers who have at least some familiarity with the Python programming language, this book uses a straightforward, step-by-step approach. Each lesson builds on the previous ones, enabling you to learn the essentials of implementing the Django framework on a website from the ground up. Navigation bar is an important part of the web application since it is the map that guides the users in different parts of the application. For better user experience navigation bars should indication which option is currently selected by the user. A common way to indicate which option is selected is by simply changing the CSS style of the selected option. This is a pretty good implementation but from my point of view it has one problem. It binds the url patterns with the template page. If you need to change the url pattern you must not forget to change the template also. Furthermore, what happens if you ship the application and the client decides to change the urls of the application. Fortunately django has two features that allows to push this implementation one step further. As you can see we have totally decoupled the url patters from the template page. I know we have coupled it with the url names but there are no reasons whatsoever to change the url names since they are not visible anywhere, from now on we can change the url patterns as we wish. Also note that the href tag has changed to the new variable that we created so it points to the correct url. Important: There is not need to change the template tag.